The Anacostia River, which has for decades functioned as the polluted washbasin of an urban watershed, may now have less bacteria than the Potomac River during rainfall. In mid-March, DC Water opened the floodgate on a 2.3-mile section of concrete tunnel that’s been under construction since 2005. With the rolling away of a concrete slab, about 80 percent of the polluted sewage and stormwater runoff that has for decades flowed into the Anacostia will be diverted into this underground tunnel. 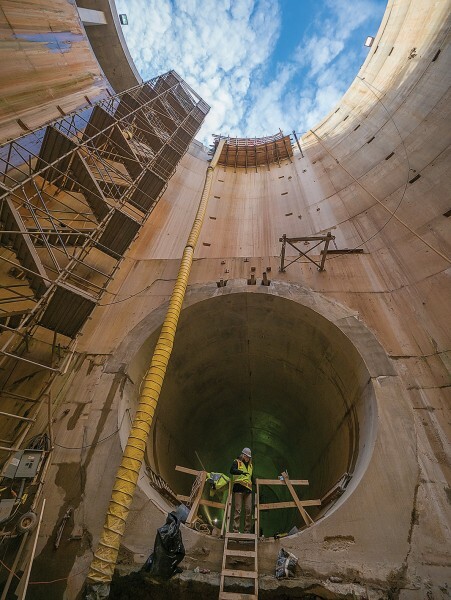 In this first of several sections of tunnel under construction, more than 400 million gallons of polluted water can be stored in the bowels of the city until the utility’s wastewater treatment plant can fully treat and release it into the Potomac. “There will be immediate benefits to the Anacostia,” said Vincent Morris, a spokesman for DC Water, which provides water to the District of Columbia as well as sewage treatment to the district and the broader metro area. The opening of the tunnel represents the first major milestone in what the utility calls its Clean Rivers Project, a $2.6-billion effort to curtail the sewage-laden runoff that has routinely poured into Chesapeake Bay rivers in the nation’s capital for more than a century. When a second phase of the project is complete in five years, 18 miles of water-storing tunnels will be winding their way beneath the city, curtailing almost all polluted overflows — 98 percent in all — to the Anacostia. Combined with other efforts to reduce stormwater runoff above ground, the project should reduce the amount of nitrogen headed to the Bay by one million pounds per year. Nitrogen is the most plentiful pollutant fouling its waters. Before the massive infrastructure plan was adopted by DC Water, the concept was driven by small, grassroots organizations and concerned citizens. They saw in this urban waterway — so filled with refuse that it was dubbed “forgotten” — the potential for restoring aquatic life and making the river an asset rather than a liability for the District of Columbia. “For years and years, the government would show slideshows about the Anacostia and what was wrong with it,” said Robert Boone, who founded the Anacostia Watershed Society in 1989 and served as its president for 20 years. Those slideshows, he said, included photos of the combined sewer overflows, or CSOs, that would gush sewage-laden water into the river during heavy rains. “And then they would move onto the next thing. That was just part of DC,” Boone said. At the time, ending those overflows seemed so expensive and complicated that it was deemed all but impossible. Officials said it would require digging up the entire downtown area to separate the sewage pipes from the stormwater system. A lawsuit brought by Earthjustice on behalf of the Anacostia Watershed Society and other groups in the mid-1990s ultimately forced the District government into action. DC Water, under a different name at the time, entered into a long-term agreement with the U.S. Environmental Protection Agency to begin the painstaking and costly work. The utility’s compliance plan has evolved over the years. The tunnels emerged as a way to increase the plant’s treatment capacity — rather than digging up the streets to rebuild the city’s system of pipes. In 2016, the plan was modified to allow water-filtering green infrastructure to replace some of the tunnels by reducing the amount of runoff entering the system. Moore said DC Water has spent about $1.4 billion on the project so far. More than one tunnel segment is under construction at a time to stay on pace with what will be the fourth most expensive project of its kind in the country. Under the leadership of George Hawkins, who retired in December after eight years at DC Water, the utility garnered praise for embracing and improving a project that was required by a federal consent order. Doing what’s necessary to stop raw sewage from entering the rivers might seem like a common sense priority today, but it wasn’t always — and it still comes at a cost. A few days before the tunnel came online, Boone reflected on the Anacostia’s last 30 years over lunch at a newly minted winery-and-restaurant in the district, joined by Jim Foster, who became the Anacostia Watershed Society’s president in 2009. The restaurant, Ana at District Winery, is named after the river that flows just beyond its floor-to-ceiling windows at The Yards Park, a sprawling, walkable strip of retail that was the first to prove the so-called forgotten river could be reimagined as a centerpiece of waterfront real estate. “This whole land here was a no man’s land,” Boone said, gesturing to a boardwalk where a woman in a sundress was being photographed with the water behind her. Today, an Anacostia Riverwalk Trail covers 20 miles on both sides of the river and follows the water’s edge to Nationals Park, the baseball stadium, and to the newest batch of restaurants opening in its shadow. The walkway spans the water near DC Water’s new futuristic office facility under construction — complete with sewage pipe-powered geothermal technology. It offers unsuspecting walkers firsthand views of the concrete outfalls where polluted water used to stream into the river during storms. That water will be diverted to this first segment of tunnel, pushing the river closer to the watershed society’s goal: a swimmable and fishable river by 2025. When that happens, chef Kyle Bailey says he wants to be first in line to serve the river’s fish and shellfish at his seafood-focused restaurant, The Salt Line, which opened last year near the end of the boardwalk. From their vantage point just south of those outfalls, Bailey told Foster, the water quality seems to be slowly improving. The futuristic dates Foster and other river advocates have been talking about for decades are finally arriving as this first segment of tunnel comes online. Now that the foundations have been laid — and major obstacles are being removed — it’s easier to imagine the clean river that once seemed out of reach. Shiny, waterfront development goes a long way toward that vision, as does a massive tunnel that will immediately divert pollution. But those factors could also be the tipping points on the backs of decades of small projects aimed at improving one aspect of the Anacostia at a time. When it’s released this month, Foster said the Anacostia Watershed Society’s latest river report card will show a 20 percent improvement in its grade over last year. Most of that progress can be attributed to the opening of the tunnel. But several other efforts are coming to a head in the Bay’s most populous region, leaving the river’s natural systems primed to “kick into gear,” Boone said. Bacterial pollution from human sewage isn’t the only factor that's kept the river from being deemed swimmable; there’s also the large goose populations in places like Anacostia Park whose waste and consumption of burgeoning underwater grasses were keeping wetlands from reaching restoration goals. Park officials began systematically culling overabundant geese in the park in 2016, a controversial move that has paid dividends for water quality, Foster said. The watershed society regularly transplants wild celery, a species of underwater grasses that once grew in the Anacostia, into portions of the river where invasive grasses have sprung up in recent years. They’d like to see the native species return as both a contributor to and harbinger of better waters. The same is true for the freshwater mussels, which biologists recently began tracking in the Anacostia and are considering propagating to improve water quality. Groups started counting mussels in 2016 to get a baseline of the populations that were once plentiful in the river — with the hope that their growth will be a sign of water quality improvements into the future. By the time the full system of tunnels is complete, river advocates hope to have made progress on another ongoing source of contamination: the toxics seeping from river’s sediment and shores. Anacostia’s industrial past, with nearly a dozen plants along the river considered potential environmental cleanup sites, will be the focal point of the next expensive undertaking, which could entail removing or capping contaminated sediment in the river. Foster says that will be the last leg of a marathon river cleanup. But people might not have to wait until then to enjoy it. Excessive bacteria levels are the main reason the river is not swimmable, and the tunnel’s holding capacity will put a big dent in those numbers.